After spending nearly four months in Cuba in 2013 - I fell in love with Cuba: the culture, the people, the steamy capital, and most of all the dance and music. 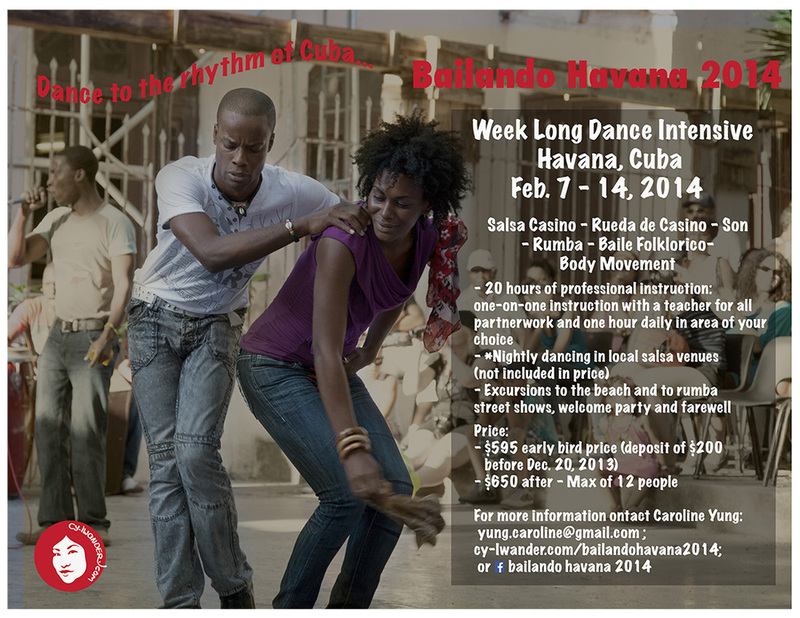 I would like to share my experience with you in a one-week intensive Cuban Dance Workshop from Feb. 7 to Feb. 14, 2014 in Havana - Vamos a bailer en Havana! This winter escape from the cold to the heat of Cuba for a week long intensive workshop in Cuban dance and culture. Come to see a different side of the country, separate from the all-inclusive resorts and all you can eat buffets - this is not a lazy beachside holiday. Get to know locals and the bustling capital as you progress through the workshop. Take four hours of dance classes during the day, and spend the evenings dancing the night away at top local salsa venues and concert halls in Havana. Study Cuban dance and music with the Mari Suri Escuela de Bailes Cubanas, an internationally recognized school with over 19 years of experience. Areas of study include: body movement, rumba, afro-cuban folkloric dance, as well as the more classic salsa casino, rueda de salsa and son. Cha-cha-cha, danzon and other styles can be incorporated based on interest. Accommodations: Private room and bathroom (casa particulares) available at or near the school for 7 nights, for only $175 single occupancy and $88 per person (double occupancy). Expect to budget between $50-$75 daily for the costs listed above. **Maximum of 12 spots on this trip (minimum of 4 required) - RESERVE YOUR SPOT TODAY!